I love storytelling and I love film. My journey to actively chronicle the history of my ancestors has been a long one, and in that time many of their stories have struck me as very cinematic, imbued with dramatic weight and visual consequence. The following is a small treatment for a historical drama that I would eventually like to make into a feature film. The story is set in 19th century Switzerland and South America. It is essentially a story about perception, unseen forces, loss, handicap, and the redemptive nature of love. It is a story inspired by the lives of Henri de Büren and his deaf son Gustave de Büren. The material concerning the South America Amazon is directly inspired by Henri's 19th century travel journals, A Voyage Across the Americas - The Journey of Henri de Büren, which was published in late 2013. The French version of his journals, Voyage aux Amèriques - Lettres et journal d'un jeune baron Neuchâtelois, was published in May of 2015. Light started to fade as the sun slowly dove for the horizon. The golden hour quickly approached, the stone walls of Vaumarcus castle taking on a hue of imperial yellow, satisfying in contrast to the glistening blue-green water of Lake Neuchâtel below. Their play is interrupted by the governess. She motions from the balcony, it is time to get ready for supper, play will have to wait for another day. Les repas du dimanche with de Büren family and friends are always a treat. A sumptuous Sunday meal adorns a long table surrounded by well-heeled family and invited guests. Crystal goblets, fine china and silver serving dishes beam in the candlelight. The same youthful abandon that prevailed outside hours earlier is absent here. Adult pronouncements, polemics and high-minded idealism bathed in generalities rule this world. Gustave and his siblings are meant to be seen and not heard, an irony not lost on him. After dessert, he and his siblings march off to bed, Gustave’s stomach is full yet his heart yearns, yearns for something he dare not name. At the window now, a brisk morning, birdsong lightly on the air. Gustave longingly stares through a leaded window frame as his younger siblings leave for school, a school outside, outside these walls. “Gustave, come back and sit down for your lesson” his governess signs to him with a knowing faint smile. Mademoiselle Muller has always been kind to he and his deaf sister Jeanne. But Gustave doesn’t want to be different, he dreams of being ordinary. Do people in town look at him that way because he’s the Baron’s son, or is it pity for the deaf boy? While he would like to be at the village school, lessons at the castle are not wholly without advantage. The afternoons are his to roam the vast woods behind the castle as his chooses with his closest friend chestnut, an orange and white brittany. Words are not necessary here. An ongoing conversation between he and the woods is nurtured every time he returns, one of emotional resonance, one where everyone is heard and understood. Night has fallen, Gustave’s mind is racing, sleep elusive. With great care he silently leaves the room he shares with his two younger brothers and walks down the dark hallway in the direction of his father Henri’s study. Dappled moonlight dances on the paneled walls, highlighting ancestral portraits with disapproving eyes that follow his every step. His father’s study is lit by lamplight and Gustave furtively glances through the crack in the door that is slightly ajar. His eyes are drawn to the open armoire behind his father who is deep in thought. Brightly colored feathers grab his attention. They sit alongside what resembles a severed human head with dark masses where eyes had been and twine spilling from the mouth. Gustave gasps audibly in surprise and horror at such a discovery. Hearing the sound, Henri looks up from his desk and sees Gustave’s face lit by lamp light in the door jam. Gustave meets his father’s gaze, and hurries back to bed. Like the time he was caught stealing sweets from Monsieur Jeanneret’s Patisserie his heart is racing, his face hot, his throat dry. Henri turns to look at the severed head, his own eyes as vacant, a pained expression crossing his face. He slowly closes the creaking armoire door. 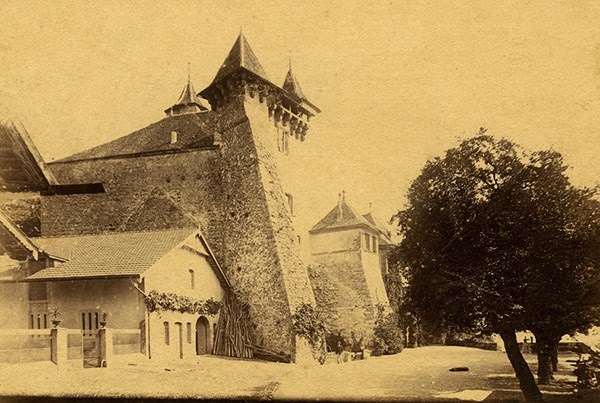 The next morning, Henri and his father Albert, both noted naturalists leave the castle for a meeting of the Swiss Botanical society in Bern. They are expected to be gone for a couple of days. As the carriage makes its way along the lakeside heading for the Train station in Neuchâtel, Albert is engrossed in a book as Henri lost in thought casts a long gaze on the lake’s surface. The sun glinting off the water triggers memories of other waters, other destinies, and transports him back to the Amazon twenty years hence. A large white riverboat comes into view, making its way down a wide dark serpentine river, its smokestacks belching and sputtering. There is a din of bird calls and primate hooting that punctuates the thick night air. The steamer Marajon slows and drops anchor along the rivers edge. The solitary figure of Henri de Büren, a Swiss nobleman, botanist and explorer can be seen on deck. He is ruggedly handsome. He wears a cream colored careworn suit that is lit ever so gently by the moonlight. His hat shades his piercing blue eyes that have seen much these past two years. The first mate picks up his gun along with his leather shoulder bag and makes his way down the gangplank. Henri looks into the vast verdant expanse teeming with unknown peril. Henri is weary, he hesitates momentarily, then grabs his own revolver. He checks the chamber, picks up his bag and disembarks. They both look at the river boat’s ghosty outline one last time and then disappear into the jungle. After a journey through the jungle with only the moon to guide them, Henri and the first mate enter at first light a bustling marketplace in the trading hub of Santarém. There are all manner of items sold in the markets; fruit, dried fish, tools, and live jungle animals. It seems a cross between a zoo and mining towns that Henri has seen elsewhere in the Americas. Henri takes off his hat, and wipes his forehead with his handkerchief. He places his hat back on and reaches into his breast pocket for a letter, a letter that his become moist with sweat. While the Marajon’s first mate goes to get provisions, Henri goes to visit the local French Vice-Consul in Santarém, Monsieur Gouzenne for whom he has a letter of introduction. Gouzenne has been a business man in Brazil for some 10 years, and has done well for himself on the edge of the forest. He had the pleasure of showing the great French naturalists Castlenau and Mauraval around Para some years earlier and appears very well connected. The past two years Henri has collected plant species from throughout the Americas but before boarding his steamer home he desires something truly unique, a rare mystical artifact, a totem from the dark reaches of the New World, an object to enliven conversations over digestifs at the castle. Having heard about the about the local headhunting tribes on the river steamer from Loreto, Henri inquires with Gouzenne about the possibility of bartering for local ceremonial objects. He has heard that the objects bring the possessor great hunting prowess. At Henri’s inquiry his host becomes perceptibly nervous and then regains his composure, only to change the subject. Henri and Gouzenne dine together and the consular residence, their conversation touches upon a wide range of subjects, politics, art, but eventually Henri returns to his desire for an Amazon trophy. Gouzenne becomes inexplicably agitated and stresses his unwillingness to help. Henri starts to believe ten years of hot Brazilian sun has started to affect his host. Gouzenne cuts the meal short and says he must return to work. Henri feels slighted by the abrupt change in tone, but nonetheless thanks his host for his hospitality. With his father and grandfather absent, Gustave and his siblings freely play in the castle courtyard. His aunt Sophie - a spinster with a connection to the unseen - asks if Gustave would like to join her for a walk. She is not going far, she is on her way to visit the sick Aubert boy. Gustave agrees and joins his Aunt who is well versed in the healing properties of medicinal plants, many of which she finds in the vast botanical gardens of the castle. They walk for a while until they come to a small farm house. Sophie and Gustave are ushered in to a small room where a boy Gustave’s age is bed ridden and gravely ill. She deftly makes a herbal remedy from a host of plants and roots and provides comfort both to him and his grief stricken parents. As she puts the tonic to the boys lips Gustave sees his Aunt’s lips moving ever so gently urging the boy to drink. Gustave is moved by his aunt’s compassion. On the way back to the castle Gustave is deep in thought. He has seen sick children before, but he knew this boy to be strong, energetic, and willful. He signs and asks his aunt if the boy will recover and why he suffers? “We don’t know the will of God.” she responds. His question catches her off guard, and words fail her. She pulls him close and hugs him tightly, hot stinging tears rolling down her cheeks. The questions of destiny and fate seem to hang in the air, and upon their return to the castle, Gustave goes out into the woods with his dog. After walking for a time, he bends down to inspect a colorful leaf, and notices movement out of the corner of his eye, but so does his dog. There is a great stag standing tall amongst a thicket of trees. The dog instinctively takes off after the majestic beast, Gustave cannot call the dog back and gives chase. They run through the woods at breakneck speed, the stag, the dog and Gustave. Close by, a local hunter sees the flash of the running stag, he whirls around and takes aim. A shot rings out, piercing the afternoon stillness, one that Gustave cannot hear. The hunter has seen the boy and his dog too late. “Mon Dieu, not the Baron’s son”, his heart racing. He runs to the spot to find Gustave bloodied, disconsolate and softly weeping at his dog’s side. The hunter has missed the stag but has killed Gustave’s closest companion. Word of the accident reaches Henri and Albert the next day and they return at once to the castle. On the way home Henri feels deep unease. It’s happening again. He thought he had escaped fate’s cruel hand, isn’t his handicap enough, a cover of darkness starts to envelop him. The voyage back to the castle are filled with mental flashbacks of death for Henri. A local boy who died in a farming accident, his sister Charlotte, the death of an immigrant on the roadside in Peru during his expedition and most tragically his first wife dying in his arms only weeks after their wedding, gasping for breath, beseeching him for help. Henri returns to the castle and immediately comforts Gustave but there is strange distance. Henri is already oddly detached. Later that evening Sophie approaches her brother. She is more than a healer, she holds sway with the next world, one where fate and myth intersect. She broaches the subject of the Amazon artifacts, admonishing him, “I warned you long ago that if you didn’t respect the power of these ancient objects, they would turn against you, and only bring you misery.” Outwardly Henri seems dismissive, but inwardly he believes dark forces may be at work, again. The Marajon is ready to shove off. Henri waits on the shore for Gouzenne’s servant. There is a rustling of leaves and branches as a figure emerges out of the dark forest. It is Eduardo but he looks different, his face pale, his gaze vacant. “It’s going to cost you double. I risked my life for this.” His voice tremulous. Henri hesitates and then gives him the money. The servant hands him a jute sac, his hand trembling. Eduardo tells Henri that the head will now make him a great hunter. Henri turns and boards the steamer for his final leg to the Atlantic. On deck he turns to look at Eduardo, but he has vanished. That night as the steamer makes its way towards the mouth of the Amazon, Henri dreams of a great consuming fire and a jungle hunt, a jungle hunt where he is the prey. After some time, life at the castle returns to normal and Gustave gets a new dog, but he is now forbidden from leaving the castle alone. He stays closer to home now. One stormy evening Gustave has a vivid dream about the Amazon. It is lush and magical and seems to call to him. The dream reminds him of the stolen look at the contents of his father’s armoire. The next afternoon while his father is in the garden, Gustave secretly enters his study, his curiosity driving him. He knows he shouldn’t be in the room, he could be caught at any moment, his senses heightened. He opens the armoire door very slowly, his heart pounding, and... nothing. Apart from a few family tomes, the large armoire is virtually barren. It couldn’t have all been his imagination? As he cannot stray far from the castle grounds he explores seldom visited wings of the castle, filed with disused furniture, and ancient weapons. One afternoon Gustave stumbles upon a very old strongbox, he finds it interesting but moves on, only his dog cannot leave it alone. The dog begins wildly scratching and barking, trying to get inside. To Gustave’s suprise, it is unlocked and opens it. He is greeted by the same vibrant feathers of red, blue, yellow and green he saw in the armoire. He reaches into the strongbox and removes the feathers only to discover they are a headdress. He places it on his head, his dog barking approvingly. He returns to the box to see what other secrets are to be found inside. Gustave jumps back, a shiver shoots down his spine. There in the box is the severed human head. He removes in gingerly, he is fascinated and repulsed in equal measure. He places it gingerly aside, trying not to look at it. After regaining his composure, he ventures back to the box. Inside, leaning against the side is a journal. He fishes it out and opens it. The first page reads “The voyage of Henri de Büren”. Gustave quickly skims the many yellowing pages, the city names of Boston, New York, Havana, Mexico City, and Lima jump out to him. Gustave removes the headdress and starts to read. As he reads, the journal grabs of his imagination and he becomes throughly engrossed. As days turn into weeks, Gustave no longer cares about leaving the grounds of the castle, all he wants to do now is read the journal. He reads with great relish of his father’s many encounters and exploits while in the New World. He starts to see his father very differently. He sees him as a young adventurer and not the distant parent. How could this be the same man? What drained him? What extinguished his spark of life? Gustave, buoyed by his father’s example starts to feel more adventurous himself and soon asks his grandfather if he can leave the castle and go on a hike with him. They spend many days together hiking the countryside and gathering Alpine flora. Gustave’s grandfather is impressed by his uncanny eyesight, inquisitive nature, and stamina. Gustave starts to see himself beyond how others see him, beyond his handicap. The following afternoon Gustave is again reading from the journal when he comes across the most heroic of moments in which his father prevents the massacre of Peruvian soldiers by members of his expedition. Gustave’s admiration for his father surges and he wants to share his knowledge of the journal with him. Gustave finds his father outside in the courtyard. When he excitedly shows his father the journal, Henri becomes wildly unhinged. Henri knows that if Gustave has found the journal, he must have found the head as well. Enraged, Henri grabs the journal, slaps Gustave hard on the face and forbids him from finding it again. Deeply hurt after trying to connect to a distant parent, Gustave runs away crying and accidently spooks a horse near the stable. The horse tears through the courtyard and runs down his aunt Marie and his young brother. His brother is badly hurt. Later that night Gustave sees his father comforting his brother and speaking with him tenderly, he feels guilt, jealousy and then rage. He wishes he could have that sort of relationship with his father. He decides to run away, far away. Gustave hastily packs a couple of things and leaves the castle, his dog in tow. He decides to head for the mountain cabin where he went with his grandfather. That at least is a place of happy memories. Physically and emotionally exhausted, he makes the rustic dwelling by nightfall. The next morning, Gustave can’t be found and Henri and his wife are sick with worry. He has never gone missing before. After searching the woods and asking for him in the village, his whereabouts are a mystery. Henri feels ever so slowly that the world closing in on him. Wasn’t his first wife’s death enough? To have cursed his children too? He should have left the Amazon spirits in their jungle. Henri’s father Albert and sister Sophie realize that time is of the essence. They need to help find Gustave to bring Henri back to reality. Sophie makes Henri a local herb tonic and implores her mystical spirits to help. Henri's father goes to look for Gustave. After sleeping in the mountain cabin for the night, Gustave looking for something to eat for breakfast realizes he brought the journal along. He pauses for a moment and sets it down. After the initial hesitation he picks up the journal again and reads, it’s pull is simply too strong. As Gustave is engrossed in the narrative, his grandfather opens the door, “I thought I might find you here”, he says with a smile. Gustave and his grandfather after some time resolve to go home but not before Gustave proves something to himself. Like his father and grandfather before him, he wants to climb the local mountain. His grandfather reluctantly agrees and they make the ascent together. Back at the castle, Henri is slipping away. His sister is trying to help him but to no avail. His visions are getting more vivid, he is being pursued, the jungle is out to get him. As Gustave and his grandfather climb the mountain, Albert becomes weary halfway up and asks Gustave to return with him to the cabin. Gustave finds a fortitude he didn’t know he possessed and refuses, he feels he must finish, even if it’s alone. Gustave perseveres and makes it to the summit despite his physical and emotional pain. Elated and supremely confident, Gustave returns the cabin and he, his dog and his grandfather return home. Henri is now semi-lucid, and totally distraught. While his Sister and wife are gone from the room, Henri mysteriously feels compelled to go to the barn. While in the barn he sees a vision of a Mundurucú headhunting warrior about to strike. He screams. His horse frightened, kicks Henri at the temple, his oil lamp is thrown clear. Henri crumples unconsciously in a heap. The hay on the barn floor begins to smolder. At that moment, Gustave and Albert approach the castle. They see the barn on fire. Albert signs Gustave to stay where he is while he goes to get help. Gustave wants to listen to his grandfather but he needs to rescue the innocent, he needs to save the animals. Gustave runs into the burning barn and starts to help his friends to safety. He looks down and to his surprise he finds his father unconscious on the ground. The Barn is engulfed now. Gustave’s deafness is an asset here. The animal noises and people screaming for him do not distract him. He sees a clear way through the fire and with all his might drags his father to safety. The local fire brigade extinguish the barn before the castle is also burned. Gustave’s quick action has saved them all. In the glow of the smoldering barn, Henri sees his son with different eyes. Whatever curse he perceived to be pursuing him has relented. He takes in the fresh night air, as a newborn his first breath. That night both Gustave and his father would have the same dream, one of a lush jungle, powerful loving spirits and a wide flowing river that went on forever. Wow! I love this. Excellent job! Nice job Jean-Francois! I think it could make a great film. The only problem is that selling a period piece in this market is virtually impossible. I'd write it as a novel. If it's successful, you'll stand a much better chance at getting it made into a film. Very well done! Greetings from Spanien!